The left photo shows the exposed seam. See how the gaping holes kind of curve around the project? It's hideous! You can see exactly where I joined! Yes, the holes are mostly gone, but there is still an ugly line from the slip stitches. the seam is still visible!!! I'm still making progress, the gap is hardly visible, but you can still see the slip stitches and only doing it through the back loop made horizontal bumps from the left over loop. And the chain looks a little mangled. Check out that seam.... Or can you? I feel like I've struck gold!!! No more hideous seams!! For instructional purposes, I chained 15 and joined with a slip stitch to make a circle. Starting chains using this method are 2 chains tall. So chain 2, and double crochet across. DO NOT double crochet in the same loops as your starting chain. Loosen loop on hook. Remove the hook and insert from behind into the chain on top of the first double crochet. NOT the starting chain. It looks like the 3rd chain. Chain 2, and double crochet around. This is what the first one looks like. 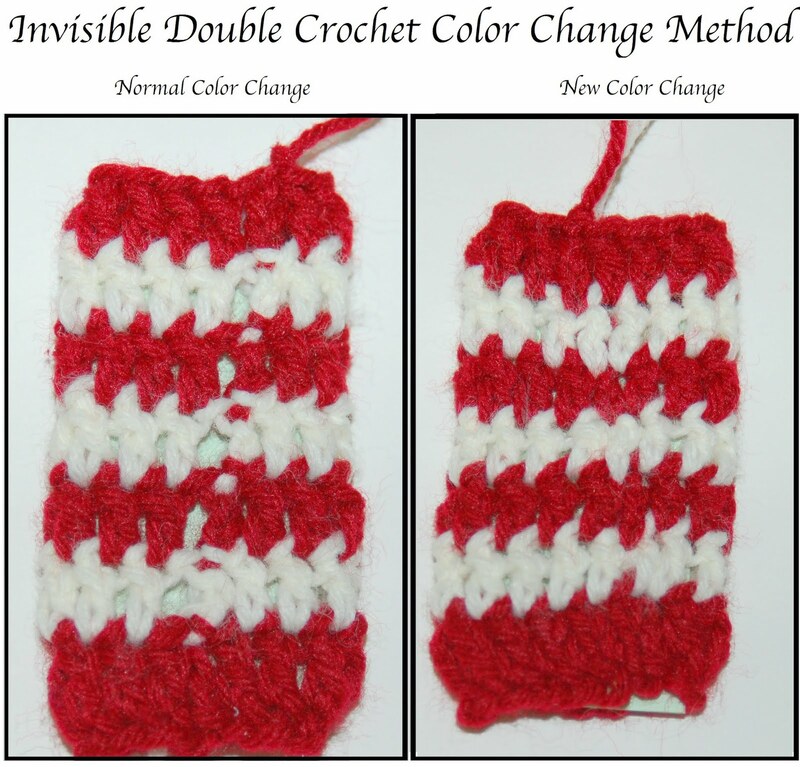 As you double crochet around, you'll notice that before the last loop, your pulled-through loop will stretch alot. Don't worry, that's OK. In the image above, there are TWO more double crochets left. 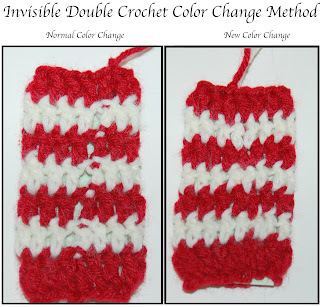 You will double crochet into the loop pulled through the chain earlier. Pull through, chain 2, and double crochet. Put the left over loop from the last round onto the hook. Chain 2, and continue around! Fasten off the top color as you would normally. Do the second color by looking at the back, you'll see the tail and the last loop left over from the previous row. Beautiful seams and flowing stripes!! Now, please keep in mind that I just BARELY developed this like, an hour ago. I posted this to get some feedback and let me know what you think! I realize that you can sort of see the seam because of the loop pulled up through to start the new round. However, I'm working on a solution to that, and I'll post you any updates to this technique after I get back from vacation in two weeks! I think it is great. I am going to copy it to my crochet patterns and try it soon as I get done on the blocks I am currently doing. Thanks for posting it.